New collection for fall. Beautiful! We got a little carried away (again) ordering batik. We finally found shelf space for all of this but we're overstocked! Come in and check out the beautiful new bolts. We will be closed on Monday, September 1 for Labor Day. Have a fun, safe holiday weekend! This special Saturday morning event is for everyone who has taken Beginning Quilting at Cortez Quilt Company since we opened three years ago. Bring your original beginning project and/or anything you’ve made since you began quilting for show and tell. We’ll screen a short video on how fabric is made (courtesy of Cotton + Steel, a new fabric company), have demos and door prizes, and everyone who attends will receive a free pattern! We hope you’ll join us to become inspired (or even more inspired than you already are!) to continue your quilting journey. Please RSVP by calling 970-565-7541 as we will be serving a light breakfast. Sewing Sunday – September 14, 12 noon – 5 p.m. Spend a relaxing afternoon sewing at the shop. Bring a project you have in the works or start something new. Sewing Sunday is always free and snacks are provided. Space is limited, so sign up today. 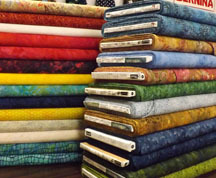 Third Thursday Demo – September 18, 12:30 p.m.
Our Third Thursday Demo for September will be on how to use Electric Quilt 7 software to design your own quilts. If you are already a user, please join us and share your tips and tricks. If you've never used this software you’ll be amazed by how intuitive and easy it is to use. Third Thursday Demos are always free. Join us! Mystery Quilt – The Big Reveal, Saturday, September 27, 9 – 10 a.m.
We have a large group wrapping up our most recent Mystery Quilt program. We hope you’ll all come on Saturday morning to show your finished quilt. If you didn’t do the last Mystery Quilt you are welcome to come see what everyone else created. Like last time, those who attend and sign up for the next mystery quilt will receive 10% off if they purchase fabric for the project after the Big Reveal. Refreshments provided, so please RSVP. 10:15 a.m. – 5 p.m.
Make three of these baskets in different sizes using just one jelly roll! Clothesline is encased inside the fabric strips which are then sewn together to create these baskets – or bowls if you prefer to call them that – in a variety of shapes. Embellish your baskets with buttons or beads if that strikes your fancy. Guest teacher Donna Corb will be your instructor for this fun class. Sign up today. The last one filled up quickly! We held this class in late June and it was full and had a waiting list. So we’re doing it again! 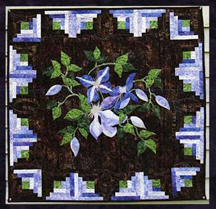 Make this beautiful Clematis wall hanging or choose a sunflower instead. Cyndi Foote will teach this class where you’ll learn both raw edge applique and make log cabin blocks. We have a few kits available. Click here to see more classes! Cyndi Foote came across this online color test the other day and passed it along. It's really fun and takes just a few minutes. The lower your score, the better. Take the color challenge, e-mail your score to info@cortezquiltcompany.com and in the next newsletter we'll publish the names of the three people with the lowest (best) scores. Then you'll all know who to ask to come shopping with you when you're choosing fabric for a quilt! We'll have special hours on Sunday . . .12 noon - 4 p.m.
25% off all BERNINA presser feet and select embroidery software! BERNINA CLUB - FREE THIS MONTH FOR EVERYONE! To get ready for SEW-CESSORIZE sign up to attend BERNINA Club which will be held on Tuesday, September 9 at 5 p.m.. For this meeting, instead of sewing as we usually do, we'll show a video on BERNINA presser feet and how to make the best use of them. BERNINA Club is held every second Tuesday at 5:00 p.m. This special meeting will be over by about 6:30 (future sewing meetings will go until 8 p.m.). Bring a snack or dinner if you'd like. Beverages provided. BERNINA Club is usually $12 but for this special video presentation we're making it FREE for everyone regardless of where you purchased your machine. If you don't have a BERNINA and you're curious to learn what the machines can do, join us! Please call us at 970-565-7541 to put your name on the list for Tuesday, September 9 at 5 p.m.